Losing a loved one is never easy. When you’re grieving this loss while trying to move forward without this person, you’re often left with little energy or emotional capability for much more. Unfortunately there are items that need to be taken care of after the funeral occurs. One of these tasks is sorting through your loved one’s belongings. Physically, this is no small job and emotionally, it will take a toll because of all the memories you will be confronted with and feelings of guilt, frustration, and sadness at having to part with more of this person. So what is the best way to navigate this task? The first step is to make a game plan. Writing out your plan of attack can help make the job easier. You need to decide if you will go room by room, floor-by-floor, or will you tackle it in groups of items such as clothing first, books second, furniture third, etc.? By writing out your plan you will stay on track. Plus the sense of accomplishment each time you check off an item from your list will keep you going. The other part of your game plan should be how you’re going to break items into the Keep, Donate, Family Requests, and Trash categories. Make sure you talk with other family members before starting the clean out process so you know ahead of time what items they wish to have. This will save a large headache later on. It is also important to give yourself a limit on how much you are willing to take into your own home. Setting this limit will help you avoid piling 20 boxes of items in your garage that you don’t have room for. After your game plan is set, you should think about help from others to get through the process. First, consider how much help you want and then think about what type of help you want. Some prefer to sort through possessions by themselves while others need a support system. Sometimes it helps to have others there to share in your grief plus they can help you part with items that are too difficult to get rid of on your own. They can be your voice of reason as well as a shoulder to cry on. Another option for those who don’t have the time or the emotional capacity to go through all of these possessions, is hiring a professional organizer who will go through the items for you. Developing a timeline can also be helpful. How much time do you have to sort through all the belongings? Deciding on your timeline can then help you determine how long you think you can work each day before you become overwhelmed or too exhausted to be productive. If you know that emotionally you can’t spend more than 3 hours a day sorting through items then set your alarm at the start of each clean out session so you don’t overdo it. The last piece of advice is to go into this process having decided you won’t feel guilt over the decisions you make. 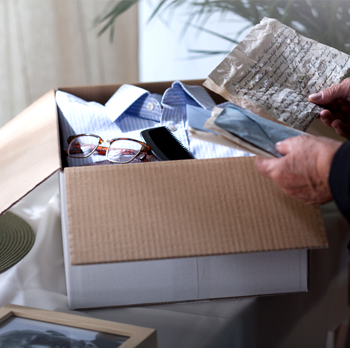 Deciding to donate or throw away certain items is not throwing away your loved one. You have the memories of them and the time you shared which is far more important than the physical object. Making it through the sorting process is one more step towards helping you get to a place where you can enjoy the memories you have.